Family owned, operated, 3 generations of Estheticians. Including massage, spa packages, facials, eyelash extensions, permanent makeup, eyebrow microblading. Appointments recommended. 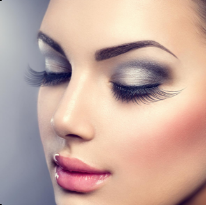 Choosing the best permanent makeup studio. Our team of makeup rtists are licensed aestheticians. Lavender Falls Makeup Artists excel at permanent makeup for brows, eyeliner, full lips, lip liner & scalp micropigmentation. Our permanent makeup team uses a soft touch and steady hands to provide you with the best permanent makeup you could ask for. We can be reached at 210-446-0903. Browse our website and review our before-and-after photos. Please contact us to schedule an appointment or if you have questions prior to booking an appointment. We will be happy to answer your questions and discuss what you would like to do with permanent cosmetics. Eye, Lip, Lash and Brow! Walk-ins are not recommended and an appointment is required. During our discussion on the phone with you we may discuss setting up a free consultation if you are ready. We will review color, shape and other important aspects with you. This will also be done in rooms with natural light as well as fluorescent lights so we see what the end result will look like in real life. Not just under a fluorescent or incandescent light. 50.00 consultation fee waived if service performed following consultation. What can I expect during permanent makeup application? The aesthetician will tattoo the permanent makeup pigment into your skin to enhance your existing beautiful facial features. Permanent make up can also be used for camouflage and scars. Numbing creams will be applied. Permanent lip liner can take anywhere from 30 min. to two hours depending on the clients designs. If a fill is involved this adds to the time needed to complete the process. Permanent eyebrows (micro bladed) take @ two hours. At Lavender Falls Face and Body Spa the procedures are performed using sterile and disposable needle cartridges and electric implantation tools. Our use of single use instruments prevents transmission of any diseases and is safe for our makeup artists and our clients. Your safety and our safety is a primary concern. Unlike a tattoo studio permanent makeup artists can use topical anesthetics that are extremely effective in minimizing discomfort. People generally say that they feel a tickling sensation, depending on their threshold for pain. You will likely feel some buzzing and pressure and most clients don’t have any issues due to our ability to use topical anesthetics. There may be some swelling, scabbing and possibly discoloration for the days following your tattoo. Tattoo artists cannot use the effective topical anesthetics that Permanent Makeup artists use on the face. Our pigments typically last 4 to 5 years some colors may not fade for as long as 10! Periodically you may want to come in and touch up to maintain your desired look. Alyssa has been doing my eye brows for the third time already and I swear I won’t go anywhere else  I actually have everybrows now, not only does it fill them in but helps me grow them out at the same time! I highly recommend lavender falls! You definitely won’t be disappointed  oh and I always numb up pretty good, so I don’t feel a thing! Our permanent cosmetics eyebrow microblading technique is praised by all of our clients. We also do full lip color tattoo, permanent lip liner & permanent eyeliner San Antonio ladies rave about. We employ a 3d eyebrow microblading process. If you’re looking for the kind of Permanent Eyebrows San Antonio ladies are raving about contact us today or visit our Permanent Eyebrow Microblading page & our permanent cosmetics before and after photos.